The Yantra Mat is a gentler version of the ancient Indian nail bed. 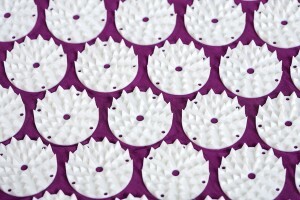 A real sensation in Europe, the Yantra Mat (also known as a “spike mat“) is studded with 8,820 non-toxic ABS plastic spikes (see image below). The spikes feel sharp, but with your body’s weight distributed evenly over the mat, the initial feelings of discomfort quickly give way to a sensation of heat rushing through your body. This natural response to acupressure comes from increased circulation, which lowers blood pressure and soothes aches and pains. Within minutes, this improved blood flow triggers a deep sense of calm and relaxation. In a recent survey of 304 users, 96.7% described positive effects from the Yantra Mat – and over half of all participants said the mat helped relieve their pain. Whether you want to spice up your yoga routine, ease your back pain, or feel more centered and stress-free, the Yantra Mat is perfect for you. Mats come in green and purple, and in three sizes (Medium, Large and X-Large). This entry was posted on Friday, February 19th, 2010 at 11:47 am and is filed under Uncategorized. You can follow any responses to this entry through the RSS 2.0 feed. Both comments and pings are currently closed. 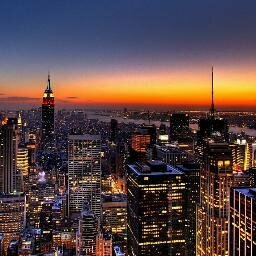 Over the last twenty years in the West there has been a growing surge of interest in Eastern forms of exercise, meditation and self improvement. Yoga of many kinds is now practiced by a large and increasing number of people in their search to find tranquility and calmness in a crazy world. The Yantramat is an example of how a single artifact taken from yogic culture has achieved remarkable market prominence even among people for whom it is their first connection with yoga. What is the Yantramat and how does it work? What does it do? The Yantramat is based on the ancient yogic concept of the ‘bed of nails’ a device created by the yogis and others ( the Russian peoples also had the same idea) to go beyond limiting patterns of the mind, to go beyond pain and to achieve peace and inner stillness. When you lie down on the Yantramat, the spikes stimulate the Marma points. These are points that in Ayurvedic and yogic healing have a predictable effect on the energy of the body. This stimulates the flow of ‘prana’ or life force to flow through the ‘naadis’ the tiny channels which form a network to carry the prana into the whole body. The increased flow of prana has a harmonising and relaxing effect on the biosystem which creates the ‘feelgood’ factor that attracts people to the mat. One of the ‘8 limbs of Yoga’ as defined by the great Yogi Rishi Patanjali is ‘pratyahar’ which is usually translated as ‘withdrawal of the senses’. It is a technical process which involves synchronization of all the sensory input to one single point or thought or focus. In this way the scatteredness or the ‘all over the place’ monkey mind is trained to obey its owner. The Yantramat is an exceptional tool to experience the yogic state of ‘pratyahar’. Until full scale doubleblind tests can be done on the Yantramat, no medical claims can be made. But we can hear the great experiences that people have reported using the Yantramat. Thousands and thousands of them! I have taught yoga and meditation for 30 years and as Director of the International Kundalini Yoga Therapy Training course I am aware of the need to help people to change their relationship with their own thoughts, to ‘stop’ their mind. The Yantramat is considered an invaluable tool here at Kundalini Medicine to help people slow their process down and be very still and very present. Enjoy and savour the Yantramat, a modern version of an authentic piece of Yogic culture.